“G. L. Bajaj Institute of Management and Research (GLBIMR), Greater Noida and Soka Gakkai International have organised a 3 days exhibition in G.L.B.I.M.R’s Greater Noida Campus from 26th September- 28th September 2015 . The event is open to all colleges and school students as well as residents of Greater Noida. Bharat Soka Gakkai (BSG) is the Indian affiliate of the Soka Gakkai International (SGI), a global association of grassroots organizations that seeks to promote the values of peace and respect for all people, drawing its inspiration from the humanistic life philosophy of the Japanese Buddhist sage, Nichiren Daishonin (1222-1282). 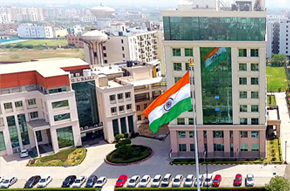 BSG has its membership spread over 300 towns and cities across India, with its headquarters in New Delhi.